Ascending Butterfly: Win Perfume for Mom! - 3 winners will win their choice of gift from The Cream Perfume Company! Win Perfume for Mom! - 3 winners will win their choice of gift from The Cream Perfume Company! This giveaway is now CLOSED. Thanks so much to our wonderful sponsor The Cream Perfume Company! We look forward to working with you again! The winners are: Amber, Marlena, & lmurley2000! Congrats to our three winners! Remember: There are great giveaways active on the upper right hand side of the page! This was gift #2 in our first annual Mother’s Day Buying Guide! We are now launching our second gift in our first annual Mothers Day Buying Guide! We started with the gift of CleanRest (giveaway ends on 04/28), and now we are moving on to what many consider a Mother's Day gift 'staple', fragrance. Our mom's are unique and selecting a fragrance to match your mom's spirit is part of the fun! Is your mom youthful and playful? Is she untamed and energetic? Is she spicy and exotic? Let's avoid fragrance for mother's day becoming what ties have become for father's day, generic and impersonal, because neither gift should be! Fragrance should be as fun to shop for as it is well received by the recipient. It's just a matter of matching the fragrance to the spirit of it's recipient. My mom is outgoing, she is strong, brave, compassionate and fun! So we tested out these products together! First let me introduce the company! They work with internationally renowned perfumers and the local artisans of Grasse to develop premium nature identical oil blends, ECOCERT certified organic essentials, absolutes and pure plant and fruit extracts.Their perfumes are all phthalate free and contain no sulfates, petro-chemicals, synthetic dyes, triclosan, GMO, PPG, MEA, DEA, TEA or formaldehyde donors. Products are cruelty free. The perfumed body moisturizers are 100% vegan, wheat and gluten free, contain no glycol, parabens, sulfates, phthalates, silicones, synthetic additives or synthetic fragrances. The world's best ingredients are used to luxuriously hydrate and repair your skin combined with unique fragrances to simply delight your senses. They focus on environmentally friendly packaging and overall eco-value. The perfumes are made sans alcohol, which eliminates the need for glass packaging. And that's a good thing, the solid perfumes are housed in the most adorable environmentally friendly residual wood containers! The wood is from small mills that meet the criteria set out by the Forest Stewardship Council, whose mandate is to promote environmentally appropriate, socially responsible, and economically viable management of the world’s forests. We started with CleanRest and now have 'Clean & Green' perfume! Ah, mom really will be proud of us! 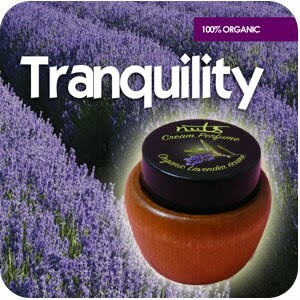 A premium organic, 100% natural perfume for true lavender lovers. Exceptionally clean notes of lavender from top to base with a touch of lavendin for the heart notes. Ascending Butterfly: Goes on smooth, the perfume is a solid, so I placed it in the palm of my hand and warmed it up a little with my finger and then applied to pulse points on my neck, wrist and temples. It goes on strong and mellows quickly into a soft 'clean' scent. Mom: I also found that the scent is strong and noticeable when I first put it on, and then does 'die down' after a short period of time, I applied directly to pulse points except my temples. We also tested the Mimosa Bouquet (it's bubbly with soft floral notes) , Mango Poudré (it's fresh and powdery), and Ylang Ylang d'amore (it's exotic, it's warm and like wearing your favorite incense!) in addition to the lavendar écume (this one goes on a bit more noticeable than the others for some reason, but I am a lavendar lover so I was happy with that!). It's difficult to pick a favorite among the four I tried. They are very different, and match very different moods. We enjoyed them all and both agreed that the packaging really is hard to resist, it's just so esthetically pleasing! And the fact that's it's also 'green' makes it that much better! We also had the chance to test a variety of the body lotions as well. 6oz. Premium and naturally derived oils and extracts from nature combined with premium French certified organic essential oils to combat dehydrated, sore, inflamed and damaged skin. Ingredients: Water (Aqua), Cetearyl Olivate, Sorbitan Olivate, Glycerin, Carthamus Tinctorius (Safflower) seed oil, Butyrospermum Parkii (Shea Butter), Olea Europaea (Olive) Fruit Oil, Fruit Extract, Fragrance, Aloe Barbadensis (Aloe Vera) Leaf Juice, Xanthan Gum, Panthenol (Pro Vitamin B-5), Corn Starch, Phenoxyethanol, Ethylhexylglycerin. This was the perfect companion to the solid perfume, it goes on silky smooth, it is not greasy, nor is it overly thick! I found it very soothing. My hands were particularly dry when I tried this lotion out. My skin did drink it in, and I was pleasantly surprised that a little went a long way and also lasted a long time. We also had the opportunity to try out the Rose de Rosée, and the Coconut Vanille scented body lotions. Again we both agreed that these go on silky smooth, not greasy or thin, nor overly thick. They also lasted well between hand washings. I appreciated the opportunity to be able to layer the lavendar lotion with it's matching cream perfume! The Cream Perfume Company is now butterfly tested and mom approved! Ƹ̵̡Ӝ̵̨̄Ʒ - WIN IT! - Ascending Butterfly and our friends at The Cream Perfume Company would like to provide THREE lucky winners with the opportunity to win the product of YOUR choice! Don't you just ♥ The Cream Perfume Company? How to Win: (1) You must be a PUBLIC follower of Ascending Butterfly to be eligible for this and all giveaways. Indicate in your entry that you follow (if your 'comment name/user id' differs from your profile id, please let me know what name you follow under) and (2) Visit The Cream Perfume Company and post the URL of the product that you will select if you win as your comment entry! Please post the LINK, not the name! You can select the item of your choice, either a solid perfume or a body lotion. (3) You must also leave your email address somewhere in your comment. (You can format it this way for security, example: ascendingbutterfly AT mail host DOT com, If it is visible in your profile, just say so, that's OK!). Please follow the easy 1, 2, 3 steps to winning! This giveaway is open to BOTH USA and Canada residents who are 18 years of age or older. I voted for your mom on the ICE.com contest! Voted for "Cookie" on Beautiful Moms! I am a follower and would love.. I would love the http://www.kaponga.com/detail.aspx?ID=34. I follow your blog publicly (jenbutterfly12). I like the http://www.kaponga.com/detail.aspx?ID=29 Raspberry des Champs solid!! yland ylang d'amor is what i chose. It seems exquisite. I selected the ylang ylang as well - looks like it would smell fabulous! This is what I would choose for my Mom! I follow your blog publicly with google friend connect, with the name Theresa. I would love to win the Melon d'eau solid fragrance. I follow you on twitter, id terri142. I am following you with networked blogs. Follower on GFC and I'd choose the Rose Body Moisturizer. I follow your blog. I love the Lavender Body Moisturizer!